Sir Cecil Jones Attuquayefio of Accra Hearts of Oak has made a strong case for the local coaches in Ghana after masterminding the defeat of Kumasi Asanti Kotoko, handled by German Hans Deiter Schmidt in the finals of the inaugural Africa Confederation Cup played in Kumasi last Sunday. 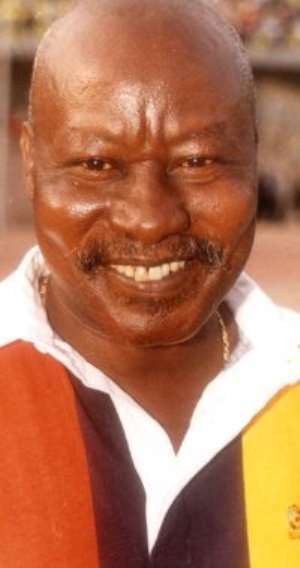 Sir Cecil Jones who steered Accra Hearts Of Oak to win their first continental trophy, the Champions League in the year 2000,by this achievement has become the first African coach to win all the Three coveted soccer trophies on the continent, The Champions League, the Super Cup and now the Confederation all within a period of Four years with the same club, Accra Hearts of Oak. It may seem that with the recent appointment of Ratomir Dujkovic as the coach of the National team, the Black Stars, the unending debate as to whether Ghana should go for an expatriate or a local coach for the Black Stars job had died down. Dujkovic has also advocated and insisted that his number two man should also be a 'Light Skin' man or his compatriot and the signals are that the GFA and the Ministry of Youth and Sports have kowtowed to his demand. By this arrangement Ghana is going to cough $20,000 and $25,000 every month for their emoluments less other logistics such Car, Fuel, Maintenance, etc. All these are happening against the back drop that no foreign coach has ever won any major silver ware for the nation or a club side, whiles such multi talented and soccer brains such as Jones, Sam Addy, Abdul Razak, Afranie, to mention a few who have proved their worth both within and outside the nation are relegated to foot when it comes to the National job. It is even sometimes amazing the way they are treated when they are made as stop gaps when these same expatriates dribble and run away with our hard cash. Oh God What is really wrong with us as a people!. I indeed celebrated the Hearts of Oak victory over Kotoko for the simple reason that at the end of the day, Jones a local man has silence an expatriate Schimdt to tell those in charge of our beautiful game that the Ghanaian coach is more than capable of handling the national team. The same local man, Sir Cecil was voted African coach of the year some four seasons ago after wining every trophy that matters in Ghana and Africa, yet our officials thought because of his skin he was not fit to handle the national team. With public outcry and pressure from the soccer loving people of Ghana becoming intense, Sir Cecil was handed the Black Stars job albeit temporally without even a written contract. Jones was booted out unjustifiably after assembling a local squad comprising players mainly from his Hearts of Oak trusted boys who were all in their top form to battle mighty Super Eagles with all their super stars to a goalless draw game at the Accra sports stadium. This was at a time when the foreign based players were loosing to war raged countries like Liberia in Accra. Instead of encouraging the coach, he chastised, criticized and eventually booted out. Jones left Hearts for Dansoman based Liberty Professionals where he transformed the club to play some beautiful soccer which won them the accolade “Scientific Soccer Lad”. He succeeded in beating Hearts at the Accra stadium on two occasions which hitherto un- head of. Sir Cecil made another giant stride by succeeding to become the first coach to qualify the unsung Benin national team to their first Cup of Nations finals in the year 2004 in Tunisia whiles the Black Stars in the hands of an expatriate coach fumbled terribly. It is undeniable fact that the CVs of Jones and some of his local compatriots are unparallel by any of the expatriates who imported to take charge of the national team. Kumasi Asante Kotoko for sometime has been gambling with these expatriates who consumes about 80% of the club budget for the past five years has nothing to show to justify their stay. Kotoko in recent times has suffered some of their embarrassing defeats at the hands of Hearts and local man Jones, whiles having expatriates in charge. Their 3-0 drubbing at the Accra stadium some two seasons ago and last Sunday's lost were all in the hands of foreigners, Ian Porterfield, an Englishman and Deiter Schmidt a German. I pray that the signals will now be very clear to our soccer officials that it takes more than just a “Light Skin” coach to win trophies and tournaments. The recent behaviors of Milan Zivadinovick and Mariano Barreto who walked out of their contract with our hard cash should have convinced our Officials that the time has come to put the breaks on the importation of these foreign coaches and put the destiny of our national team in the hands of Ghanaians. After all the foreigners has come and gone with our moneys without achieving anything so should the job be given to a local and he flops, our money will still remain in the economy. No one can really convince me that these expatriate coaches, some of whom only come to use our national team to improve their CV, love Ghana than the local coaches. Another intriguing case in point is when Kumasi Asanti Kotoko sack Golden Boy Abdul Razak after helping the club to win the premier league for the first time in almost a decade amidst accusations of match fixing, to go for a foreign coach again. Kotoko had languished in the soccer wilderness and in the shadows of Hearts of Oak for almost a decade with expatriates, Ernst Midendorp, Ian Porterfield and Rauf Zumdick in charge of the club for four continuous seasons without achieving anything until Razak descended to the seat to take them out of the doldrums at the end of the 2003 season. Razak was axed and replaced by Schmidt, a former King Faisal trainer to carry Kotoko into Africa. Schmidt succeeded in supervising Kotoko's exit from the lucrative Champions League whiles his compatriot Midendorp doing same at Hearts. Midendorp ended his marriage with Hearts but Kotoko kept faith with Schmidt. The Phobians made a quick U-turn to solicit for the services of their former local tactician Jones to take them through the new CAF Confederation Cup. Sir Cecil Jones accepted the challenge and promised the Phobia fraternity of bringing the trophy to the capital city. I wish to state that Sir Cecil took over at a time the Phobians were in shortage of quality materials with players like Don Bottey completely off colour and their dependable goal tender Sammy Bathez Adjei off to Tunisia. He managed with what was available and played all the six confederation cup matches with one defeat to qualify for the finals. Alas, Jones has delivered on his promise at a point when the odds were heavily against him and his charges by wining the cup for Hearts and how sweet it was, against their arch rivals, in their own backyard with a white man directing affairs. He had a week earlier played a pulsating 1-1 drawn with Kotoko in Accra. At the end of that match he lost two of his regular and dependable lieutenants, Dan Coleman and Eric Nyarko through suspension for the final match. Whiles the expatriate Schmidt in the days preceding the Kumasi game was everywhere from Joy FM through BBC to CNN predicting total annihilation of the Phobians in Kumasi, local man Jones kept his calm, identified what went wrong with his team in the Accra match, and went straight into business to mop up working strategy for the grand finale. He re-shuffled the team by starting General Osei Kufour, workaholic Francis Jojo Bossman and Mike Donkor taking the place of suspended Coleman. The team really played a great throughout the match and never even panic at a point they were down. A mark of Good Coach. Now the result of the match is history whiles the debate on local or foreign coaches for Ghana will resurrect in the weeks ahead. I hope this debate will not die but Ghanaians will discuss and debate it dispassionately. For now, the Master Tactician Sir Cecil Jones Attuquayefio has made a stronger case for the local coaches. I therefore salute him and all his able lieutenants led by Skipper Osofo Amankwa Mireku, General Osei Kufour, Dan the Rock Quaye, Midfield Dynamo Lawrence Adja Tetteh, The Chairman Tommy Okai and his management, the Assistant Team Manager Shaban Quaye and all PHOBIANS who thronged both the Accra and Kumasi stadia to cheer the team to this historic victory. I say Ayekoo for a job well done. Accra Hearts of Oak indeed NEVER SAY DIE! Sir Raymoo, Sweden Views expressed by the author(s) do not necessarily reflect those of GhanaHomePage.